Look Out Texas, Here Comes Nancy! Nancy is a “Woman of Substance” and a TOP 10 Artist! 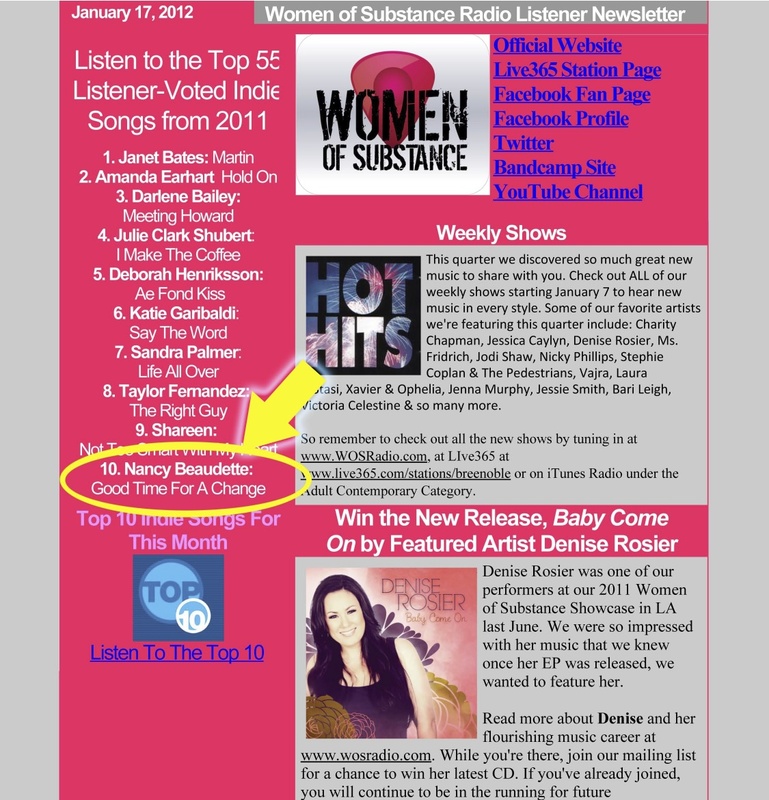 We’re so pleased to see Nancy’s name on this impressive Top 10 List from WOSRadio. Women of Substance Radio is a streaming, online radio station which airs 24/7 on the Live365 Network and iTunes Radio. Women Of Substance Internet Radio features label artists and Indie artists in all genres side by side. They hand-pick all of their music starting with icons of the past like Carole King, Joni Mitchell, Carly Simon, and so many more. They also play many indie artists, all of which are carefully selected by their review board, adding only the best quality artists and songs that can stand up next to the forementioned superstars. Tune in and have a listen by clicking here. Nancy Beaudette followed the lead of her songwriting heros when she took the stage last Sunday night at the Bluebird Cafe in Nashville, Tennessee. The Bluebird Café is one of the world’s preeminent listening rooms and the venue has gained worldwide recognition as a songwriter’s performance space where the “heroes behind the hits” perform their own songs; songs that have been recorded by chart-topping artists in all genres of music. Located in a small strip mall outside of downtown Nashville, the 100 seat venue is unassuming in appearance but some of the most significant songwriters and artists have performed on this stage. Our reputation as a listening room is based on the acoustic music that is our signature style. Our patrons repeatedly tell us that they are captivated by hearing songs performed by the creators themselves. 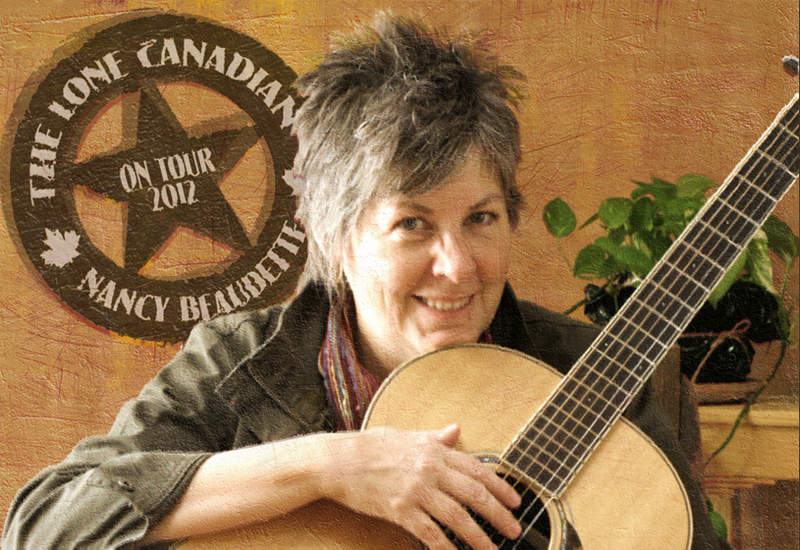 For the past four years Nancy has been frequenting this Music City, performing in listening rooms around town and c0-writing with numerous artists. 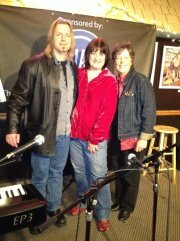 She will step onto the Bluebird’s Stage again on Sunday, June 10th, 2012.